August 25, 2011: Imagine forecasting a hurricane in Miami weeks before the storm was even a swirl of clouds off the coast of Africa—or predicting a tornado in Kansas from the flutter of a butterfly's wing1 in Texas. These are the kind of forecasts meteorologists can only dream about. Could the dream come true? A new study by Stanford researchers suggests that such forecasts may one day be possible—not on Earth, but on the sun. "We have learned to detect sunspots before they are visible to the human eye," says Stathis Ilonidis, a PhD student at Stanford University. "This could lead to significant advances in space weather forecasting." Sunspots are the "butterfly's wings" of solar storms. Visible to the human eye as dark blemishes on the solar disk, sunspots are the starting points of explosive flares and coronal mass ejections (CMEs) that sometimes hit our planet 93 million miles away. Consequences range from Northern Lights to radio blackouts to power outages. Astronomers have been studying sunspots for more than 400 years, and they have pieced together their basic characteristics: Sunspots are planet-sized islands of magnetism that float in solar plasma. 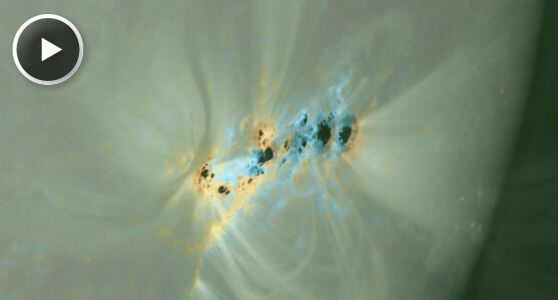 Although the details are still debated, researchers generally agree that sunspots are born deep inside the sun via the action of the sun’s inner magnetic dynamo. From there they bob to the top, carried upward by magnetic buoyancy; a sunspot emerging at the stellar surface is a bit like a submarine emerging from the ocean depths. In the August 19th issue of Science, Ilonidis and co-workers Junwei Zhao and Alexander Kosovichev announced that they can see some sunspots while they are still submerged. Their analysis technique is called "time-distance helioseismology2," and it is similar to an approach widely used in earthquake studies. Just as seismic waves traveling through the body of Earth reveal what is inside the planet, acoustic waves traveling through the body of the sun can reveal what is inside the star. Fortunately for helioseismologists, the sun has acoustic waves in abundance. The body of the sun is literally roaring with turbulent boiling motions. This sets the stage for early detection of sunspots. "We can't actually hear these sounds across the gulf of space," explains Ilonidis, "but we can see the vibrations they make on the sun's surface." Instruments onboard two spacecraft, the venerable Solar and Heliospheric Observatory (SOHO) and the newer Solar Dynamics Observatory (SDO) constantly monitor the sun for acoustic activity. Submerged sunspots have a detectable effect on the sun's inner acoustics—namely, sound waves travel faster through a sunspot than through the surrounding plasma. A big sunspot can leapfrog an acoustic wave by 12 to 16 seconds. "By measuring these time differences, we can find the hidden sunspot." Ilonidis says the technique seems to be most sensitive to sunspots located about 60,000 km beneath the sun’s surface. The team isn't sure why that is "the magic distance," but it's a good distance because it gives them as much as two days advance notice that a spot is about to reach the surface. "This is the first time anyone has been able to point to a blank patch of sun and say 'a sunspot is about to appear right there,'" says Ilonidis's thesis advisor Prof. Phil Scherrer of the Stanford Physics Department. "It's a big advance." "There are limits to the technique," cautions Ilonidis. "We can say that a big sunspot is coming, but we cannot yet predict if a particular sunspot will produce an Earth-directed flare." So far they have detected five emerging sunspots—four with SOHO and one with SDO. Of those five, two went on to produce X-class flares, the most powerful kind of solar explosion. This encourages the team to believe their technique can make a positive contribution to space weather forecasting. Because helioseismology is computationally intensive, regular monitoring of the whole sun is not yet possible—"we don’t have enough CPU cycles," says Ilonidis —but he believes it is just a matter of time before refinements in their algorithm allow routine detection of hidden sunspots. The original research reported in this story may be found in Science magazine: "Detection of Emerging Sunspot Regions in the Solar Interior" by Ilonidis, Zhao and Kosovichev, 333 (6045): 993-996. Credits: SOHO, a joint project by NASA and European Space Agency, was launched in December 1995 and is still under operation. SDO is a NASA mission and was launched in February 2010. Prof. Scherrer, adviser of Stathis Ilonidis, is the Principal Investigator of both MDI onboard SOHO, and HMI onboard SDO. Data observed by both MDI and HMI were used in this study.